Issue 1-Welcome to AAI Magazine! Aerial Arts International magazine is the First & ONLY global media resource dedicated to the aerial industry. Issue 1 is our introduction to our readers and welcome to the community of those passionate about their talent, skills and favorite apparatus's. Our cover features Danielle Rueda-Watts, a world renown cirque artist. Danielle is famous recently for her all-star lead role as 'Dirty Diana' as part of Michael Jackon's 'This Is It' Tour. She shares her insight and intelligent view of aerial life with AAI. Timber Brown, also a global cirque-icon, is featured in our 'Training' Spotlight, sharing with readers what it takes to become an aerialist. Also enjoy our regular Q and A, Trick Spotlight, Global Events Calendar, Product Review and 'Look What I Can Do' photo sections. We are excited about our long-awaited first issue, and hope you'll love it too! 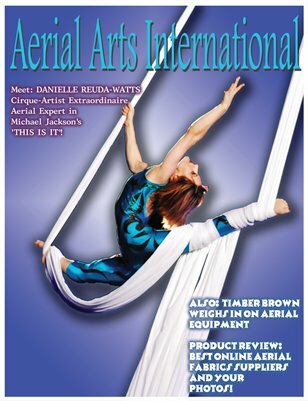 Aerial Arts International: Issue 1-Welcome to AAI Magazine!